CEDAR PARK, Texas – March 7, 2017 – Home sales in Leander, TX increased 15.8 % in February 2017. Additionally, home prices increased (when compared year over year), according to the February 2017 housing market report released today by the Darian Rausch, REALTOR® of Keller Williams Realty. 92 homes were sold in Leander, TX during February 2017, a 8% increase from the year prior. The median price for Leander, TX homes increased 4.5% year-over-year (Feb 2016 to Feb 2017) to $267,675. Homes spent an average of 82 days on the market. 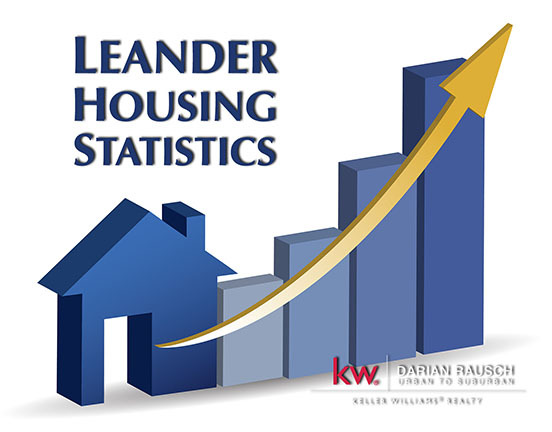 Additionally, there were 547 active listings for the Leander housing market during the same period, an 3.79% increased from February 2016. 92 – Homes sold, 8% percent increase than February 2016. 82 – Average number of days homes spent on the market in February 2017. 547 – Active home listings on the market in February 2017. With a growing economy, booming population, and high quality of life, Leander, TX located in Williamson County, is a great place to live, work and do business. As such, the demand for Leander, TX real estate remains strong and enduring. Darian Rausch, REALTOR®, is a member of the Williamson County Association of REALTORS®, and is an Accredited Buyer Representative, Seller Representative Specialist and Certified Negotiation Expert. Darian Rausch also holds a certification as a Williamson County Residential Specialist. For more information, visit www.urbantosuburban.com. Certain information contained herein is derived from MLS listing data provided by Austin/Central Texas Realty Information Service as well as the Central Texas Multiple Listing Service.